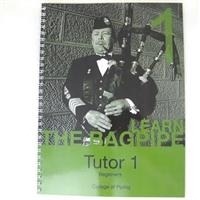 This first book in the College of Piping instructional series is a vastly popular and widely recognized learning tool for anyone interested in playing the pipes. This volume was recently updated from the original, which was introduced in 1953 and is now spiral bound. The photos, exercises and 14 tunes are excellent for beginners with little musical background .